You can find a microcosm of France in its swimming pools. The outdoor ones are only open for two months in the summer – certainly no quibbling, heatwave or not. Rules are important, even in leisure time. Once I dared to ask to borrow a kickboard – un kickboard, apparently – and the (admittedly Parisian) lifeguard explained patiently that, since the pool would close in September, they had already given away all the equipment. This was at the beginning of July. . . Here in the south, the water is beautifully warm. Our visits to the local pool mark an otherwise lazy day in the garden, planning what to eat next. Normally we go to the market first, stock up on warm baguettes and enormous tomatoes. Today we found “pineapple tomatoes” with succulent yellow flesh, perfect with ripe avocado and a sprinkling of salt. The lady at the vegetable stall was the best dancer at the annual garlic festival, I whisper to my mother. Which one? The diminutive sixty-something lady, with a twinkle in her eye – she was leading the line dancing last year. When we have bought a case of peaches, tasted all the cheeses, and walked past the duck stall two or three times to swipe a bit of melting rillettes on toast, we go down to the swimming pool. It opens at twelve o’clock precisely, when most people go home for lunch. It is empty enough for us to do laps, for my stuntman brother to practise turns and jumps. In the afternoon there will be crowds of kids bombing down the slides, then begging for icecream. At midday there are a few locals, a granny or two and most notably, the man with one hairy shoulder. Every year, we try to figure it out. Only one shoulder. Hairy enough to wave like seaweed in the water, while the other is bare. Mystery. Anyway, the most French of all these routines is that of the pretty lifeguard. She takes two weeks off in August. Even in high holiday season, she must have her break too. The pool is only open for two months, and she takes a holiday. Bien sûr! My brother and I had swimming lessons every summer in France when we were small. He hated it – he hated not understanding the French. I acquiesced. The lifeguard had a different bikini for every day of the week, and a long pole she used to stop children from clinging to the side of the pool, not unkindly. No coddling. Probably why our neighbours’ kids are so well-behaved: they sit at the table for a dinner party and make polite and funny conversation. I was glad to see that nothing had changed twenty years on – a new lifeguard, but still a shivering child with floats around his waist, and a long pole. Tomorrow is the quinze aout, or the Italian ferragosto – a sacred holiday in memory of the Annunication but mainly for the time-honoured right to faire le pont and take Friday off too. Two of my favourite Italians are coming to visit for the long weekend. We will be drinking my new favourite summer cocktail, invented on one of the hottest days. A generous measure of Campari, half a glass of pink grapefruit juice and the rest topped up with sparkling water. Plenty of ice, of course. I’m afraid I couldn’t come up with a better name than ‘The Spinster’ since it is pink and gloriously bitter. 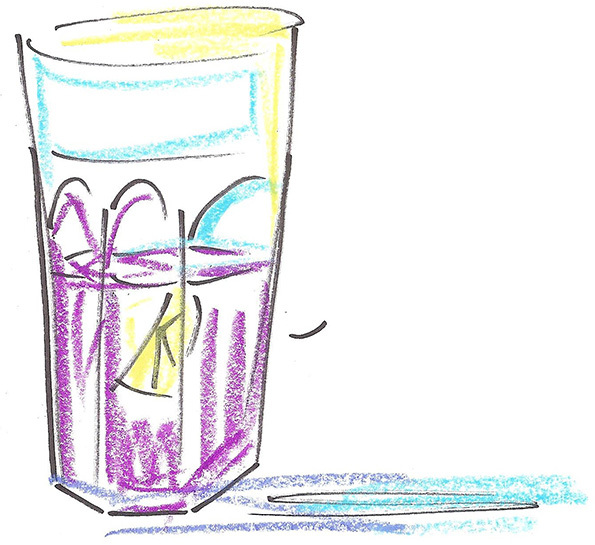 I revel in the sharp tang of the long cool drink. It reminds me of all the Spritzes I have drunk with said Italians, in the days when we were all single, if not yet spinsters. Possibly the pool will be closed tomorrow – it is the quinze aout after all – but if not, we will go for a splash there, and come home in time for sunset, where we will sit on the terrace with clinking glasses and wonder what is for supper. In a very large glass, mix all ingredients. Taste, adjust, add ice. Garnish with a slice of orange or grapefruit. It sounds idilic !!! warm summer days in France , with excellent food and company ..have fun . It makes me want to be there ! I can see from your description the market and the wonderful food stalls ..even smelling the smell !!! I will have to try the campari in the summer . Your Mum and I had campari the first time we went to Italy ..was wonderful on the terrace after a cooking class.